Sandboxes should be kept clean and dry. Sandboxes are a common feature of day care center playgrounds. Faced with the threat of lawsuits and increasing state and local regulation, however, center directors are finding that even the simple sandbox is becoming more expensive and difficult to maintain. To meet state, local, and insurance provider requirements, you should consult your state's minimum standards guidelines, but here are some safety practices common throughout the child care industry that should meet standards. 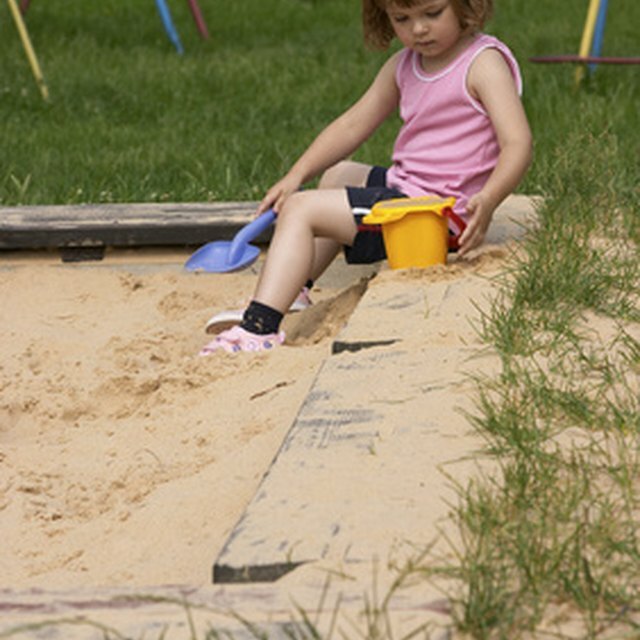 Sandbox construction materials should be durable, washable, and have rounded edges. 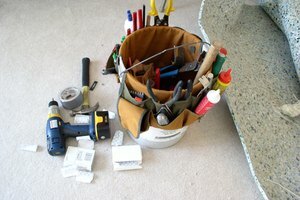 Depending on state and local regulations, you can use plastic, wood, concrete, or composite materials in construction. The box needs to allow for drainage out of the bottom to prevent water from collecting and stagnating after a rain or water play. An open bottom covered with screen with a layer of rounded gravel underneath will do an excellent job of draining water away from the sand. It also works to drill holes in the bottom of plastic boxes, but you still need a permeable surface underneath to absorb water draining from the box. Beach sand is the safest type of sand available. Look for coarse “brick sand” at a concrete or landscape supplier. Play sand, which comes in bags at home and garden stores may contain silica. It tends to be very white, and experts like Duke University toxicologist Dr. Woodhall Stopford have expressed concern about overexposure of small children to silica. There are also carbon-based sands available, but they are not as common, and given the low cost and availability of brick sand and it's superiority for building sand castles, there really is no good reason to risk it. The box should be raked and strained at least twice a month. Some day care providers pour hot water treated with a nontoxic household disinfectant into the sandbox every Friday. This kills germs left by the children, and gives the sand time to dry out over the weekend. Spritzing the sides of the sandbox where children climb in and out can be done daily as part of the closing routine, and it reduces spread of germs. 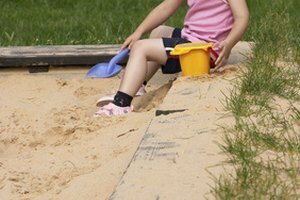 Depending on local regulations, a sandbox needs to be at least 6 to 10 feet from any play equipment or anything that a child can climb on. This eliminates children attempting to leap from a height into the sandbox, which you can bet someone will try at least once if it looks even remotely possible to make the jump. The area should be flat and surrounded by a cushioning surface like sand, pea gravel, foam padding, or cellulose-based playground cover. WCBS-TV: Is Your Child's Sandbox A Potential Health Risk? King, Tom. "Regulations for Sand in Sandboxes in Day Care Centers." Synonym, https://classroom.synonym.com/regulations-for-sand-in-sandboxes-in-day-care-centers-12080256.html. 04 October 2017.